It didn’t win the $10,000 prize. Puppetsmith Trevor Duffy says he was surprised, given all the work put into it (each puppet DJ took about 30 hours to make; you can watch the video below), all the hype and positive comments afterwards – but there is a bright side: In the manner of American Idol runners-up often doing better than the winners, the Bear promptly put Duffy on retainer for future marketing campaigns. “So we didn’t win the contest, but we won a marketing contract,” Duffy says. This was just one project the 37-year-old puppeteer and his partners Danny Jaycock and Simon Gushulak have been making an impact with. 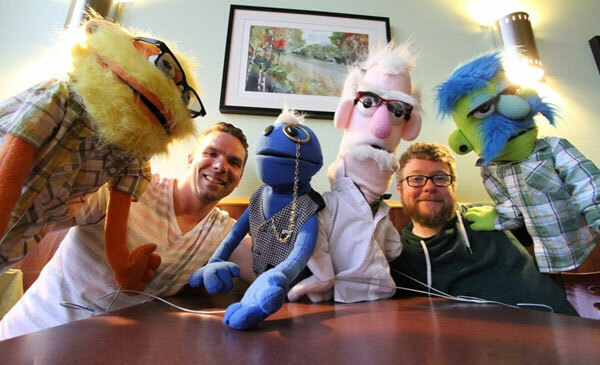 They write some of their own material, and often team up with Edmonton comedians, musicians and filmmakers, while developing their own brand of puppet comedy improv. Acts include the live children’s show The Imaginarium that comes with its own portable stage. They do music videos, the latest for Fire Next Time. They made puppet musicians for folk singer Colleen Brown, and giant battle-bots for the metal band Striker. Duffy used to be a musician (for the band Dark Sand), so he has connections. In 2013, he built 26 puppets for the show Felt Up on Bite TV, created by comedian Simon Glassman (below), in which various guests talked about embarrassing sexual secrets – in puppet form. It was a scream. Perhaps the biggest deal of all is their family show The Durflings that’s in development for a TV series. These puppets sure are making a lot of noise, for puppets. GigCity recently paid a visit to the puppetmaker’s workshop – where the magic happens. Here he gestures to a collection of foam homunculi displayed along one wall of his rumpus room. The craftsmanship is meticulous, the characters vivid and maybe a little spooky. There’s Klaatu and Loopy Durfling, sitting next to Buck and Brody Brock (another set of puppet radio hosts), various birds and fuzzy monsters – and they’re all staring at me. That they’re “Muppety” is a compliment, Duffy says, and more a description of the style of puppet than anything else. Coming soon to a children’s show near you. We can credit the provincial marriage commissioner that hitched Trevor Duffy to his wife a few years back with the kernel of an idea that eventually grew into the Imaginarium. 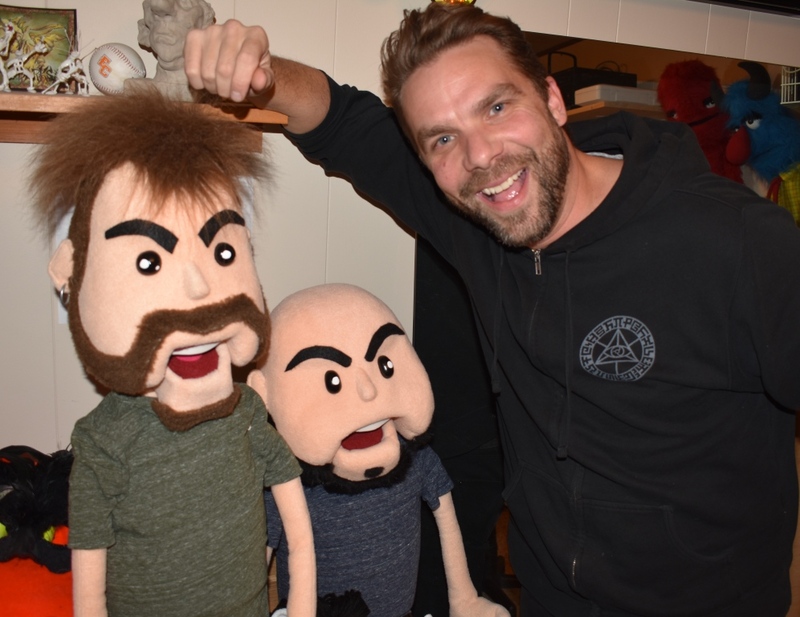 The first-time father (and his company, Duffy’s Puppets, originally known as EDM FX) had already had plenty of experience working with puppets, first building them for the Castledowns Variety Show back in 2002. After working on a few more community endeavours, the new company seized a very minor Simpsons character called Gabbo and spun out a variety show based around it, followed by an award-winning 2011 web series called Felt Up, in conjunction with local comedians Simon Glassman and Mike Robertson. It wasn’t long before Duffy and friend Chris Boyle decided to strike out on their own with the web-based effort called Social Fabric (mild bad language warning! ), rolling out the first episode in 2014, after which they were commissioned to add puppets to videos for two wildly dissimilar Edmonton artists, four-piece metal act Striker (Second Attack) and singer-songwriter Colleen Brown (Soap and Denim). 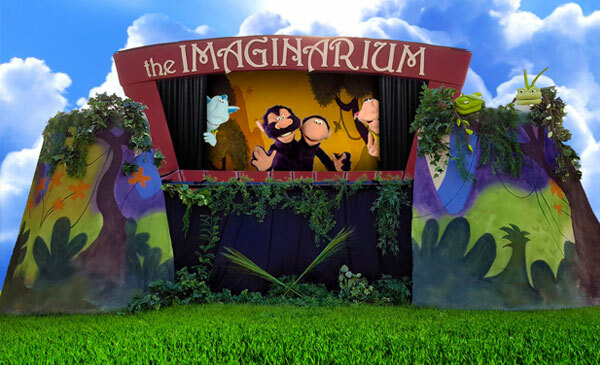 The Imaginarium is their latest project, a family-friendly show based around 12 new characters (including puppet stars Lena and Loopy) that the company can bring to summer music festivals for both kids and adults. Trevor Duffy answers questions about his company’s newest venture, which will be travelling down to the yearly Sasquatch Gathering this weekend. Q: The Imaginarium had its debut shows earlier in the summer at the Magnificent River Rats Festival in Athabasca and also at the EDM focused Astral Harvest up in Northern Alberta; how have audiences been reacting? A: At Astral Harvest I had a few people come up to me and thank us for the show. Probably it was just really nice for them to have something that isn’t exclusively music related at a festival. 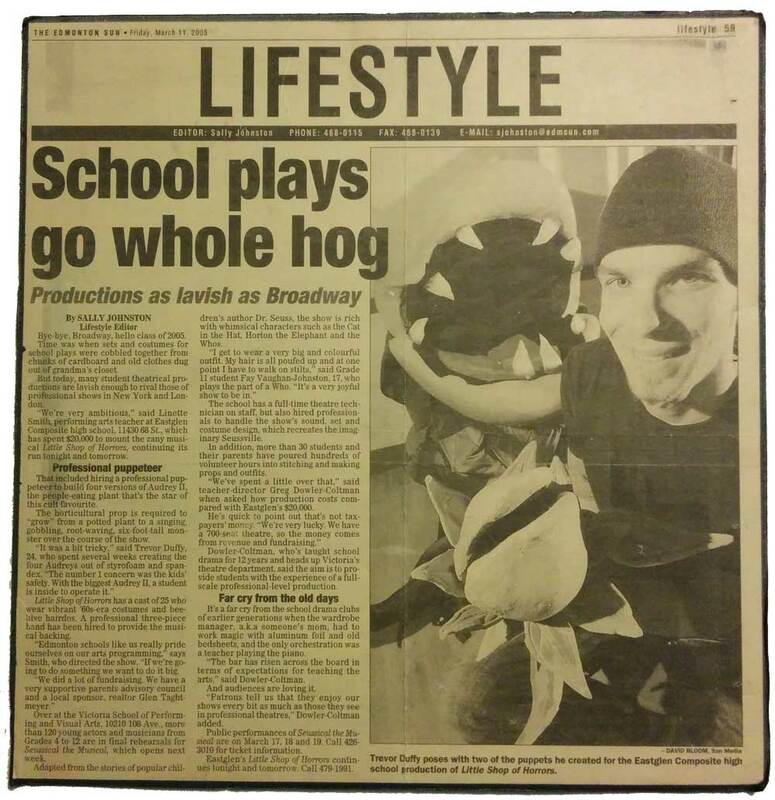 We did early and late shows in Athabasca, and while we weren’t trying to tailor it exclusively just to children, or to adults, like we did in the past with Social Fabric, the early crowd in Athabasca laughed at our Harry Potter jokes, while at the 11 p.m. show people laughed at everything. Q: Possibly they were a little more lubricated and looser at that point. A: (Laughs) Maybe we found the stoner market. 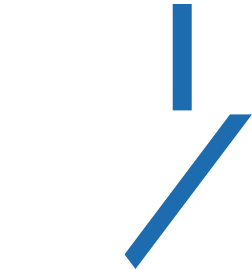 Q: Do you keep the team small with the Imaginarium? A: Everybody helps out with the entire process, nobody just shows up to perform. There are four of us; Simon Gushlak, Chris Boyle, Danny Jaycock and me, and we’re responsible for the audio tech, lighting cues, everything. Not just doing the puppeteering. Q: As you’ve said, you’ve done both kids shows and adult shows, but this time you’re specifically sticking with a family friendly theme on the Imaginarium. A: We just don’t want to be pigeonholed in one particular area. We’re still interested in both, and even though we’ve applied for a spot at the first Vancouver International Puppet Festival with the Imaginarium we’re also interested in seeing what other companies are doing in the “after dark” segment of the festival. Q: Looking at the photos this seems like it’s much more convoluted to set up than a musical performance. A: Yeah, we’ve been able to set it up in 20 minutes, but ideally it takes about 45 to do it comfortably, what with the stage dressing, backdrop, curtains and acting area. It would be nice to get it to where we just roll it out and go, that was the original concept, but we’re still getting to that point. We also have to deal with the elements, because you really don’t want it to blow over and fall on a kid! Don’t be fooled by the looks of fluffy, blue-skinned Atticus and his friends. With their floppy arms and happy faces, the stars of the new YouTube series called Social Fabric may look like your typical, family-friendly TV spectacle. But local creators Trevor Duffy and Chris Boyle are quick to explain that their show is about adult humour and the type of people you meet in a bar. That puppet is Guy (also spoken and played by Boyle), a pseudo-intellectual who spends his afternoons at the local watering hole, accompanied by his two hipster band-mates, nerd Atticus and the group’s self-appointed leader Pos. When the three find out that Ted, the obnoxious son of a local beer baron, has taken over the brewery and changed the formula of their favourite beer, they set out on an adventure to get the old taste back. It happens with a lot of crude commentary, with the help of scientist Doc (who’s liking for experiments on living things reminds one of The Muppets’ Dr. Bunsen), sassy love interest Flo, Guy’s older brother Bud, and human bartender Phil. “They are all loosely based off our friends, and the personality traits that our friends have,” says Duffy, adding that many of the characters were also inspired by people Boyle met while working at the Artery, a live-music venue in Edmonton. So far, the show consists of one, 15-minute episode with a second moving into production this summer. A first public showing will take place on Monday, June 9 at NextFest in Edmonton. Boyle and Duffy say the show is very much a work in progress and a hobby they attend to on weekends and evenings, when not working at their regular jobs. It took them almost a year to build the puppets, write the script for the first episode and film it, said Boyle. Now they’re looking to get the show out there and see how people respond to it. But the two 30-somethings aren’t newcomers to the world of puppeteers. Growing up with Mr. Rogers and The Muppet Show, the likes of puppet creators such as Jim Henson left their mark on Boyle, who went to school in St. Albert, and Duffy, an Edmonton native. 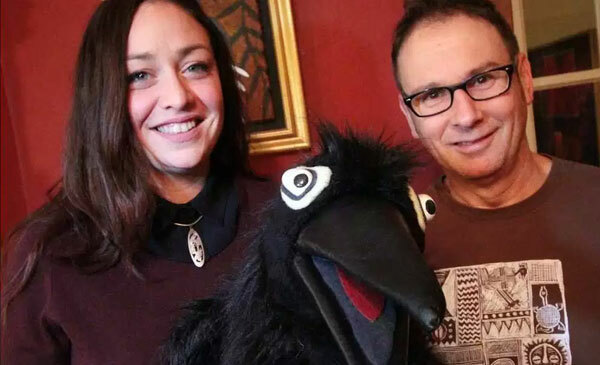 Before creating Social Fabric, the two friends had already worked with puppets for 13 years, acting at live events and even creating them for Felt-Up, another Edmonton-based TV show. The latter inspired them to create their own characters. Social Fabric was born in early 2013. “It’s just a long line of puppeteering that has gotten us to this point of doing our own,” said Boyle, who adds that they almost have more fun filming the show than watching it. While the two act out Atticus and Guy, they often need the help of their friends to perform the other characters. That can be difficult when everyone has a different schedule, said Duffy. Filming took place on locations across Edmonton, and in a wheat field near St. Albert. They produced at The Electric Treehouse, a friend’s private recording studio in St. Albert. This season of Social Fabric will consist of three episodes and a few short films, said Duffy. But they are already looking to use their puppets in other productions. They want to create an interview show where a puppet talks to different bands, he said. They are also producing a music video with the use of their fluffy companions. It would be great if they could turn the show into something sustainable, added Boyle. But they can’t compete with The Muppets, and there’s also not a big market for adult-humour puppet shows, he said. “It will be a real eye opener on Monday to see during NextFest with a group of people that we don’t know, to see what part they laugh at,” he said.